The Ferry Parcel Service is open between 07:00 - 16:30 hours, Monday to Friday. For heavier/larger consignments, our Totton depot is open from 4am to 8pm to receive goods. Should you have any questions regarding our Isle of Wight delivery service, sending a parcel to the Isle of Wight, heavier, larger or palletised shipments, or to arrange onward delivery to any UK or Worldwide destination, please call 023 8066 5950. Consignments over 40kgs will be subject to a surcharge. PAYMENT: Except for account customers, all carriage charges must be paid prior to shipment. All storage charges must be paid at time of collection and payment can be made by cash or credit/debit card. STORAGE (FOR PARCELS AWAITING COLLECTION): Rate is £4.00 + VAT per item/per day. Storage for parcels will be free for the first day after carriage. Storage thereafter will be charged at the above rate per item, per day (or part thereof), including weekends and public holidays. Consignments that are not collected within 30 days of despatch will be removed and disposed of. WEIGHT/DIMENSIONS: Acclaim Logistics reserves the right to check weights and dimensions of parcels and request the appropriate charges. 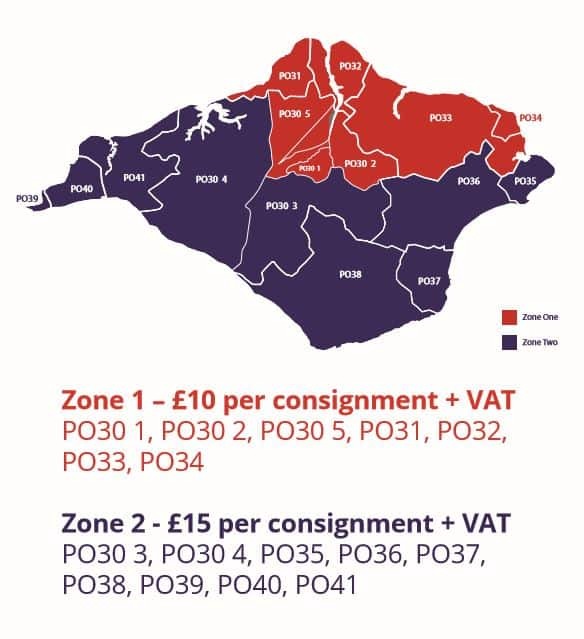 For consignments exceeding the above limits, please call us on 023 8066 5950 to discuss our range of parcel/pallet delivery options. HAZAROUS GOODS: Hazardous goods cannot be carried without prior booking on our consolidation service and will be subject to a surcharge. WE RESERVE THE RIGHT TO REFUSE TO CARRY ANY SHIPMENT. Copyright ©2015 2019 Acclaim Logistics All rights reserved.